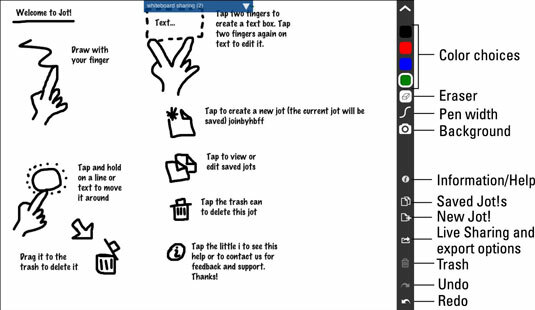 With an iPad whiteboard app like Jot!, a teacher can use drawings, images, text and media to illustrate concepts to in a classroom. Using Jot! is like using a traditional blackboard/dry-erase board, except that the Jot! whiteboard is collaborative, real-time, and digital. Jot! is a simple and fast whiteboard app that’s available through the App Store. Jot! lets you start a whiteboard and share it in real time. In much the same manner as similar whiteboard iPad apps, Jot! enables you to draw and show media. Draw or write. Use your fingers or, if you prefer, a stylus. Add text. Add text boxes for typed notes great for those who find it difficult to write legibly on their iPad. Add images. Import photos or take a picture from your iPad camera. Move items. Select and move individual or groups of text boxes and pictures. Use a Clipboard. Cut, copy, paste, and duplicate. Get creative. Choose among 16 colors, 4 line widths, and 5 fonts. Save when you’re done. Save your Jot! page to your photo library, e-mail it, or print it. Share it any way you want. Share through Live Sharing. Jot! is simple to use and looks great on the iPad. The standout feature that makes Jot! stick out from the crowd is Live Sharing. It gives you the capability to collaborate with other users locally or remotely in real time. Jot! works over the Internet so that users can share the whiteboard without the need to be on the same local Wi-Fi network. Share your whiteboard with the students in your class or students in another school or country. Imagine inviting an expert in another location to chat to your students via Skype while sharing the whiteboard in the front of the room with them. Help a student with homework after school by sketching on a common whiteboard or have students help each other. These are just two of the ways you might employ Jot! in your classroom. Tap the Jot! icon to open the app. If this is the first time you’re using the app, it opens to the Jot! whiteboard tutorial. Open a blank whiteboard by tapping the + sign in the right menu; then start writing and drawing. If you’ve used Jot! before, just tap the New Jot! icon on the top-left corner of the screen. Write, sketch: To start writing or drawing, select a color and line width by tapping their icons in the menus. Use your finger or a stylus. Tap and hold a color to change it. Add typed text: Tap with two fingers to create a text box. Your keyboard will automatically appear and you can start typing. Change font sizes in the pop-up menu above the text box and select colors in the menus on the side of the display. Tap anywhere outside the text box to close the editing tool, and tap it at any time with two fingers again to edit the text. Erase freehand drawings: Use the eraser tool to get rid of anything you’ve drawn. Add images: Tap the camera icon and select any image from your photo library, or take one with the iPad camera directly. Change Background: Background options include plain, lined, and grid, which would be a great asset for graphing anything. Move, delete, copy: Select any object by tapping and holding it for a second. An edit panel will pop up with options to move, drag it to the trash, copy it, change colors, and more. 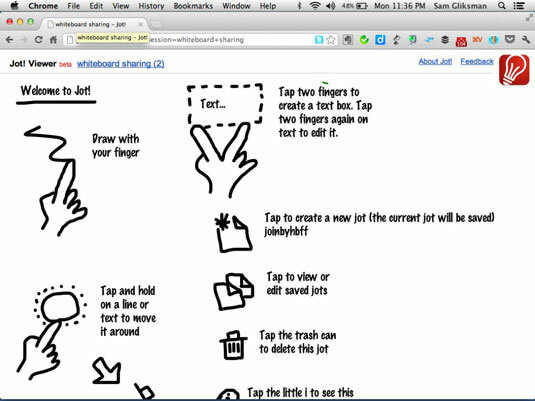 To complete your whiteboard page, tap the Saved Jots! (double page) icon to return to your list of Jots!. The completed whiteboard is automatically saved within the app. Tap any Jot! in the list of Saved Jots! to open it for editing. Through Live Sharing: At any point you can choose to share your whiteboard with anyone else who has web access. When you’re ready to share, tap the curved arrow toward the bottom of the toolbar and select the Live Sharing option on top. You will be prompted for your name and a name for the session. Anyone with the Jot! app can enter the session name to join. You can also join through any web browser by going to the Jot! website and entering the session name. Anyone can create or join a Live Sharing session for free, but to host a session, or collaborate during a session you must be a paid subscriber to the service. An alternative to Jot! Whiteboard is ZigZag. It’s designed a little more for business meetings and has excellent controls for monitoring participants, view options, whiteboard size, and more. It lacks tools for inserting typed text and images, making it a touch less adaptable for classroom use.